4.4.1 What is online collaborative learning? OCL theory provides a model of learning in which students are encouraged and supported to work together to create knowledge: to invent, to explore ways to innovate, and, by so doing, to seek the conceptual knowledge needed to solve problems rather than recite what they think is the right answer. 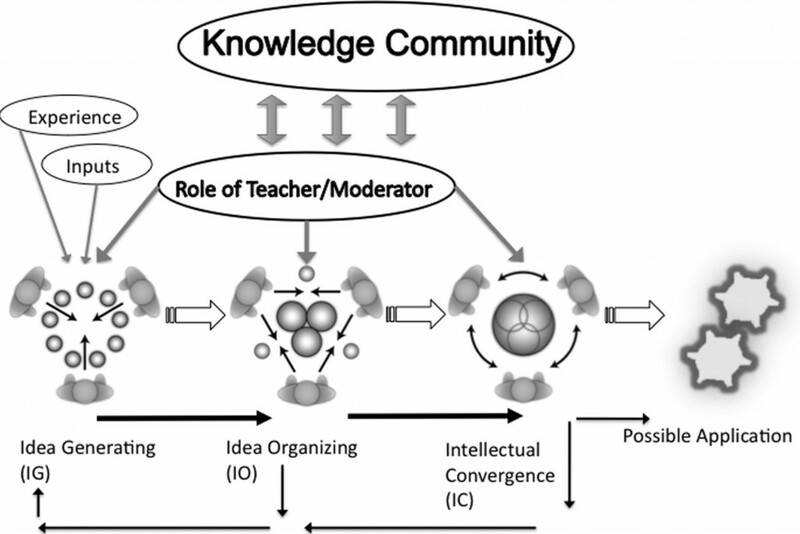 While OCL theory does encourage the learner to be active and engaged, this is not considered to be sufficient for learning or knowledge construction……In the OCL theory, the teacher plays a key role not as a fellow-learner, but as the link to the knowledge community, or state of the art in that discipline. Learning is defined as conceptual change and is key to building knowledge. Learning activity needs to be informed and guided by the norms of the discipline and a discourse process that emphasises conceptual learning and builds knowledge. OCL builds on and integrates theories of cognitive development that focus on conversational learning (Pask, 1975), conditions for deep learning (Marton and Saljø, 1997; Entwistle, 2000), development of academic knowledge (Laurillard, 2001), and knowledge construction (Scardamalia and Bereiter, 2006). From the very early days of online learning, some instructors have focused heavily on the communication affordances of the Internet (see for instance, Hiltz and Turoff, 1978). They have based their teaching on the concept of knowledge construction, the gradual building of knowledge mainly through asynchronous online discussion among students and between students and an instructor. intellectual convergence: the aim here is to reach a level of intellectual synthesis, understanding and consensus (including agreeing to disagree), usually through the joint construction of some artefact or piece of work, such as an essay or assignment. This results in what Harasim calls a Final Position, although in reality the position is never final because for a learner, once started, the process of generating, organising and converging on ideas continues at an ever deeper or more advanced level. The role of the teacher or instructor in this process is seen as critical, not only in facilitating the process and providing appropriate resources and learner activities that encourage this kind of learning, but also, as a representative of a knowledge community or subject domain, in ensuring that the core concepts, practices, standards and principles of the subject domain are fully integrated into the learning cycle. Another important factor is that in the OCL model, discussion forums are not an addition or supplement to core teaching materials, such as textbooks, recorded lectures, or text in an LMS, but are the core component of the teaching. Textbooks, readings and other resources are chosen to support the discussion, not the other way round. This is a key design principle, and explains why often instructors or tutors complain, in more ‘traditional’ online courses, that students don’t participate in discussions. Often this is because where online discussions are secondary to more didactic teaching, or are not deliberately designed and managed to lead to knowledge construction, students see the discussions as optional or extra work, because they have no direct impact on grades or assessment. It is also a reason why awarding grades for participation in discussion forums misses the point. It is not the extrinsic activity that counts, but the intrinsic value of the discussion, that matters (see, for instance, Brindley, Walti and Blashke, 2009). Thus although instructors using an OCL approach may use learning management systems for convenience, they are used differently from courses where traditional didactic teaching is moved online. However, CoI is more of a theory than a model, since it does not indicate what activities or conditions are needed to create these three ‘presences’. The two models (OCL and CoI) are also more complementary rather than competing. Since the publication of the original CoI paper in 2000, there have been a number of studies that have identified the importance of these ‘presences’ within especially online learning (click here for a wide selection). 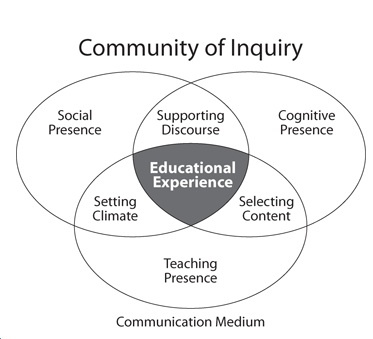 Although there has been a wide range of researchers and educators engaged in the area of online collaborative learning and communities of inquiry, there is a high degree of convergence and agreement about successful strategies and design principles. For academic and conceptual development, discussions need to be well organized by the teacher, and the teacher needs to provide the necessary support to enable the development of ideas and the construction of new knowledge for the students. These issues are discussed in more depth by Salmon (2000); Bates and Poole (2003); and Paloff and Pratt (2005; 2007). Students come to the educational experience with different expectations and backgrounds. As a result there are often major cultural differences in students with regard to participating in discussion-based collaborative learning that in the end reflect deep differences with regard to traditions of learning and teaching. Thus teachers need to be aware that there are likely to be students in any class who may be struggling with language, cultural or epistemological issues, but in online classes, where students can come from anywhere, this is a particularly important issue. In many countries, there is a strong tradition of the authoritarian role of the teacher and the transmission of information from the teacher to the student. In some cultures, it would be considered disrespectful to challenge or criticize the views of teachers or even other students. In an authoritarian, teacher-based culture, the views of other students may be considered irrelevant or unimportant. Other cultures have a strong oral tradition, or one based on story-telling, rather than on direct instruction. Online environments then can present real challenges to students when a constructivist approach to the design of online learning activities is adopted. This may mean taking specific steps to help students who are unfamiliar with a constructivist approach to learning, such as sending drafts to the instructor by e-mail for approval before posting a ‘class’ contribution. For a fuller discussion of cross-cultural issues in online learning, see Jung and Gunawardena (2014) and the journal Distance Education, Vol. 22, No. 1 (2001), the whole edition of which is devoted to papers on this topic. Many of the strengths and challenges of collaborative learning apply both in face-to-face or online learning contexts. It could be argued that there is no or little difference between online collaborative learning and well-conducted traditional classroom, discussion-based teaching. Once again, we see that the mode of delivery is less important than the design model, which can work well in both contexts. Indeed, it is possible to conduct either model synchronously or asynchronously, at a distance or face-to-face. However, there is enough evidence that collaborative learning can be done just as well online, which is important, given the need for more flexible models of delivery to meet the needs of a more diverse student body in a digital age. Also, the necessary conditions for success in teaching this way are now well known, even though they are not always universally applied. 1. Can you see the differences between ‘Open Collaborative Learning’ (OCL) and ‘Communities of Inquiry’? Or are they really the same model with different names? 2. Do you agree that either of these models can be applied just as successfully online or face-to-face? 3. Do you see other strengths or weaknesses with these models? 4. Is this common sense dressed up as theory? 5. Does it make sense to apply either of these models to courses in the quantitative sciences such as physics or engineering? If so, under what conditions? 4.4 Online collaborative learning by Anthony William (Tony) Bates is licensed under a Creative Commons Attribution-NonCommercial 4.0 International License, except where otherwise noted.